Until the sub period ends on August 6 or there’s some actual news to report, this post is going to represent a hiatus on my Club Eternia 2013 coverage, as this will officially flog the horse to paste. I’d argue too that the subscription is also at fault because it created a false perception of security and success to the Team and Mattel. Because the bulk of us had put in for everything we simply lost our ability to “vote with our dollars” and help guide the team on what kinds of figures and price points were actually desired and viable. Obviously variations of this argument have been made over the years – often in discussions regarding Mattycollector offering pre-orders – but Rustin articulates it succinctly here. More than once, a figure was revealed that I probably would never have bought in a store for the same price. To its credit, this made MOTUC a wonderfully inclusive line; small subsets of the fandom got figures that a more traditional mass market release would never have gotten around to. But Rustin’s right: denied an ability to vote for specific characters with our dollars (and in fact, forced to subscribe before even knowing half the product we’d be paying for), we had virtually no control over character selection or price point – aside from whether or not we subscribed the following year. This year, it seems, collectors are indeed voting with their dollars – and suddenly, they’re being listened to. There’s a touch of irony, too, in the fact that the subscription itself came about because of fans requesting it. For an entire year, every figure was day-of-sale. The subscription model allowed Mattel to produce sufficient amounts of MOTUC to meet demand, but once demand went down, the subscription model became not only a liability but a potential death sentence. The truth, I think, is that giving fans on an Internet forum what they say they want isn’t always the best idea, even for a niche toy line. I’m not sure Mattel should have added the bonus quarterly figures to the subscription; those were originally designed to serve as fill-ins should a figure be delayed, but with the subscription model they became another $80 subscribers had to spend every year (minus shipping)…and then the delays happened anyway…a lot. Similarly, there’s the issue of the large figures/beasts. After Battle Cat sold out instantly, fans – including, I’ll admit it, me – clamored for beasts to be added to the sub so that we’d never again have to wait six months for the figure to be re-released. But Tytus, Megator, Gygor, the Shadow Beast, Swift Wind and the Griffin never sold as well as the iconic Battle Cat or even Panthor. In hindsight, the large beasts/vehicles, due to their higher price points, were never going to sell the way a popular regular figure did. They should have all remained external to subscriptions. It would have made some of the more vocal fans gnash their teeth, but in the long run, it might have been better for the line. Then there’s the 30th Anniversary subscription. This should have been an easy win for Mattel, but instead it was a disappointment at best and a near-disaster at worst, with only two unquestionably well-received figures: Draego-Man and Castle Grayskullman. There’s an infinity of other directions Mattel could have taken with the 30th sub, and the best ones all involve paying attention to what collectors actually buy – not what they say they want, but what they buy. Characters with strong sword-and-sorcery elements (i.e., Vikor, Draego-Man) always sell well, especially to the casual collectors. Spandex-clad superheroes do not. I don’t think we should underestimate the bad taste the 30th Anniversary sub has left in many collectors’ mouths (and their wallets). Returning to the Club Eternia 2013 subscription: in reading the comments on my previous Poe’s Point, I developed a slightly modified take on what may have happened this year. 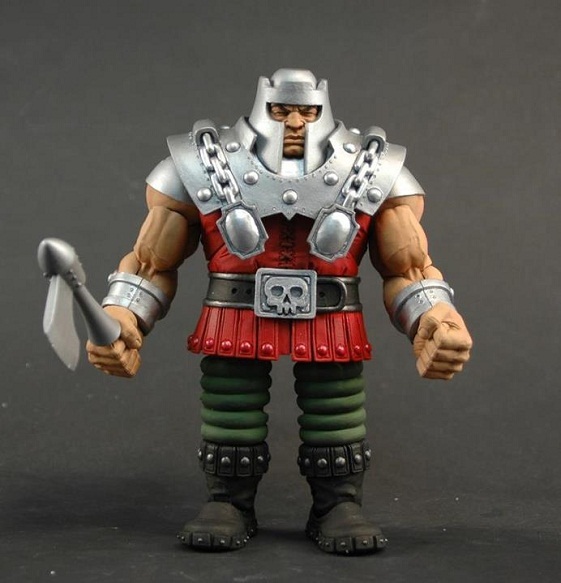 The “casual” MOTUC collectors will soon have most major vintage Masters of the Universe (not POP, NA, 200X, and so forth) character, with the significant exception of Ram Man. Combine that with what I’m seeing as a pretty significant crowding by rival lines right now (the return of Marvel Legends, new Ninja Turtles toys, NECA’s great run right now, Mattel and DC Collectibles superhero stuff, and everything Hot Toys), I can see why many casual collectors have chosen this year to stop subscribing. They all probably figure they can get a Ram Man on the secondary market. Most importantly, as casual fans have dropped off due to character selection, diehard fans have been driven away by the ongoing customer service issues. All that said, I suspect that next year’s Club Eternia will make it – just barely. But just as Club Infinite Earths barely made it last year to die (what looks like will be) an ignominious death this year, I don’t see how there will be a Club Eternia for 2014. I remember time before Mattel's action figure division. I don't know if those days are too far off again. What toyline doesn't have a share of figures that we wouldn't expect to enjoy and are suprised that we do? However, I would think that considering the 4H could be considered the real stars for MOTUC, giving them more control over the line might help boost confidence in the club. For all that Toy Guru is the face of MOTUC, taking his fair and unfair share of the blame, perhaps it is too much for just one man to endure. The 4H have displayed over the years a professional humbilty that serves to strengthen 4H's reputation even through the faults of the MOTUC and their own independant toys. You make a lot of really good points here, though you kind of contradict yourself. In the beginning saying that this year fans are voting with their dollars and are "finally" being listened too, as though mattel has ignored the fans in the past. Then you go on to shed light on how mattel has indeed listened to fan demands in the past ( perhaps to their own detriment) regarding bonus figures, beasts/large scale items, and the subscription itself. I agree 100% that giving the fans what they say they want isn't always a good idea, but I suppose looking back on the past couple of weeks, I wonder how long the line would have lasted if mattel hadn't. I mostly agree with your new ideas about why the sub for 2013 is failing, but I think the "casual collector" really needs to be taken out of the equation because the "casual collector" is synonymous (at least to me) with the cherry picker concept, and isn't someone who would have bought a sub in the first place. I also don't think that fans have been separated by faction. Though I do think POP reigns in its numbers of fans over NA I think the separation has occurred more with "all in" fans and fans who just want vintage he-man. I think that most fans of POP or NA or Snakemen are just as big of fans of the vintage he-man, but that fans of vintage he-man aren't necessarily fans of POP or NA. Given our present situation with where the line is I think we can see that fans of the vintage he-man line have almost completed their collection and so now they're going to cherry pick or buy secondary for the rest while those of us who have been in support of the lines diversity are all that remain to support the line now. I think this is playing a much bigger role than what most people think. Yes, there are issues with customer service and QC but those issues have been here since the beginning, the only thing different this year ( aside from the price increase, which I don't think is as big a factor ) is the dwindling vintage he-man selection. I suppose I kind of contradicted myself too. "casual collectors" are a main factor here and shouldn't be taken out of the equation unless they were always "casual collectors" of this line. I think vintage-heman collectors, who are not fans of POP or NA, who would have been considered "die hard" fans 2 years ago are now deciding to become "casual collectors" of this line. I guess I was making a distinction between listening to "fans" versus collectors, i.e., consumers. I did notice the contradiction when writing it and tried to clear it up a bit. Mattel has done a good job of listening to diehard fans with this line, but not enough watching what consumers – which includes both fans and casual collectors – actually spent their money on consistently. The difference in popularity between the Star Sisters (who did have something of an actual background in MOTU/POP history) and Draego-Man (a brand-new character) is a clear lesson in this. Yeah, but isn't this an apples to oranges comparison? I think a Vikor/Draego Man/Demo-Man set would have been rejected, too, because the objection is the price of the pack. Collectors of this line have been more willing to swallow a single figure they didn't like because it costs less and is a little easier to unload for cost or a couple bucks below it. But a three-pack at $60 or $75 is a tough sell and for many, a tough re-sell. I would go so far as to say that even a 3-pack of Horde Troopers at $75 would have put off some, just because of the price tag and the correlating fact that not every collector is an army builder. Fair enough, the three-pack issue is misleading. How about the difference in popularity between the Mighty Spector and Draego-Man? My point is that by paying closer attention to sales, Mattel could have been more careful about branching out into more obscure POP and non-sword-and-sorcery characters with no history in the franchise, like Mighty Spector and Cy-Chop. But that almost certainly would have meant less diversity in the line; we probably wouldn't have Icarius, and perhaps no Frosta or Netossa on the way. So it's a mixed bag. Where the subscription model really failed is by not having tiered options. They should have gone with 3 different sub levels – Single monthly figures only; Monthly and quarterly figures; All in including beasts and vehicles. If they had at least tried that for one year and it failed then they could go to the single all in sub and say they at least gave it a go. But instead they came out with the all in sub or nothing and after a few years that just wears on fans and their wallets. I don't think Mattel was ever going to offer tiered subscriptions. Digital River simply couldn't handle that level of complexity. However, they could have offered, say, a MOTU sub, a large beasts/vehicle sub, and/or a POP sub, and then whichever ones get the minimum orders get produced. Personally, I think they should have have offered 12 MOTU figures a year as a sub, kept the large beasts/vehicles as non-sub items that could be re-released if the demand was there, and thrown in one of the bonus figures whenever a figure ran behind schedule, as they'd planned in the first year or two.
" they should have have offered 12 MOTU figures a year as a sub, kept the large beasts/vehicles as non-sub items that could be re-released if the demand was there "
I completely agree! That would have made so much more sense economically. I definitely saw the slow but steady increase of Mattel biting off more than they could chew and this past year has been the worst. I thought most people were buying 2013 because of the promise of a rocking 2014 which has all of the good characters? That's my fear, to be honest. That 2013 blows chunks because Mattel decided to do a bunch of stuff that fans don't like and the promised amazing 2014 ends up not happening because everyone thinks they'll get burned again like they did in 2013. Of course, it's impossible to know, since we only know a few of 2013's lineup… But it's my fear. Toyguru has said that the 2013 lineup is locked in so the earliest changes could be made is 2014. Given the time they say it takes to put a line together from budget to production that makes sense. But dumping all the good stuff into 2014 is a double-edged sword. On the one hand the line will, as he said, go out with a bang but on the other there won't be much incentive to continue beyond 2014 if interest does pick back up. Also sounds like 2013 is going to be NA and POP heavy given his comments in that post Poe linked to. Or at least heavier than previous years. For me, it's pretty clear. Scott has said that if 2013 goes through, 2014 will come out swinging. That said, when they reveal the 2014 lineup, who wouldn't subscribe, if what they're offering actually ends up being all the remaining most wanted characters? I can't see that kind of a lineup "dying". I just can't. This, to me, is why it's most dyer that fans subscribe this year, bite the proverbial bullet (I know, not an easy task, given everything that's gone down, but it's crunch time), & just commit to pretty much guaranteeing a stellar 2014. Your focusing on only one part of what Toyguru actually said. Yes, he said that if 2013 goes through they will rework 2014 to include the remaining vintage motu and main pop and na characters to complete the majority of everyones collection BUT he also stated that 2013 has a lot of stuff fans have wanted. He's also stated several times that POP and NA are slotted 2 figures each year, so 4 combined. that leaves us the other 8 yearly figures for vintage motu, filmation characters etc. We've already seen the Snake Face shield, and I'm positive that Clamp Champ will be a part of 2013. Granted there aren't a ton of vintage he-man characters left to do but this line has NEVER given us an unbalanced release of figures except when the line first began and we were only getting vintage he-man figures. I'm focusing on it to get people to really think about subbing, as it seems that completing the vintage lines ASAP is what's top priority for most collectors, which is exactly what Scott addresses. No 2014 without 2013. As far as I'm concerned, Mattel has done an overall great job, & I love the line as much now as I did on day 1, regardless of the bumps & bruises we've had along the way. I think if the sub makes it this year, the promised vintage-heavy 2014 will perform better. But just like any movie sequel that is promised to be the last, TG/management will view a successful 2014 as reason enough to continue. Matty will come back with a more splintered 2015 line that resembles 2012, which I doubt will even sell the minimum, and that'll be that. As for the troubles this year, I don't think it's any one thing, but a perfect storm of varied dissatisfaction. The 3-packs leave a worse taste in the mouth than what was an optional 30th sub (and one that fans were asking for in the first place). TG's 30th figure didn't do himself any favors in the PR department. The price hike took some out of the game, while Digital River finally broke the backs of others. Finally, the drop in secondary market prices chilled online retailer interest, and, for casual collectors, removed the fear of not getting a wanted figure without paying an exorbitant amount. Whatever the case may be, I think the revised 2014 plan is an excellent new road map and plenty of incentive to get over this hump. I hope we make it. To be fair, this line lasted a long time, a little more than 4 years, and since 2013 subs are most probably happening, it will be a little more than 5 years. Lines have to die, that's just the way it is, I for one would be pretty satisfied if the line ended tight now. I would have purchased a separate POPC subscription, but I won't purchase a MOTUC subscription. Mainly because I have most of the MOTU characters that I want since Mattel were so quick to release them all in the first few years. But, I have very few of the members of The Great Rebellion that I want (for example, Glimmer, Queen Angella, Castaspella, Mermista, Sea Hawk and Double Trouble) and now with Filmation being available, there are plenty more members of The Evil Horde that I want (for example, Scorpia, Octavia, Filmation Hordak and Huntara). I also wish that the 30th Anniversary subscription had been a true celebration of MOTU – the old CAC winner (Fearless Photog), a new CAC winner (Castle Grayskullman) and four figures from each of the major "factions" of MOTUC – MOTU, POP, NA and 200X. Sure, it would have sucked to miss out on Draego-Man who is the true highlight of the 30th Anniversary subscription and possibly all of 2012, but perhaps he could have been a travelling exclusive instead of the TOD Sorceress? Let's not forget that many fans originally called for the sub simply to avoid the enormous day-of-sale hassle from Digital River every month, but instead of addressing the root problem (Digital River), Mattel chose to turn the subscription system into perpetually milkable cash cow with its own unique set of Digital River screw-ups. Now that they've chosen to completely ignore cherry-pickers (not only those like myself, but also subscribers who may want extras of particular figures), they're essentially saying that they don't care about (or don't care to know) what consumers want in terms of design, quality control, and character selection for specific figures. In other words, they're either too short-staffed or too lazy to pay much attention to the "demand" side of supply-and-demand, and would like to just produce X number of whatever product it feels like each month, throw them up on the website, and be done with it, rather than actually pay attention to what sells and what doesn't in order to continually evaluate and, hopefully, improve the line. I have read all the comments on here and I wont pretend to exactly understand how this line works. As a child I was the biggest MOTU fan and when I heard of this line I was very excited. The troubles that everyone is having with the subscriptions of figures that you wouldn't buy in the stores was the biggest reason I didn't sub. However I just want to go back to the start and state another reason behind me not doing it. I like I guess many of you love the original characters. So your Beastman's Merman's MAA's, Teela's, Ram Man, TrapJaw, Triklops and of course He-Man and Skeletor. As I have missed out on most of the major characetrs, due to them being sold out. I tried in the most recent Black Friday sale but failed… I can't purchase something as amazing as a Granymyr or a Priocrustus figure as they would just be these random beasts sitting in not even a half collection. This is why I don't want to buy any more of the line as I don't have the actual main characters of MOTU. If I did it would be a different story, but because I don't have the core characters I don't see the point. If Matty would make more of the originals I'm sure they would make a tionen of money. As they come out seperately , is it difficult to re-issue all of the main classics again?? As I said I don't pretend how it all works, but I'm sure if re-issues were made and a much smaller max. amount was placed on it, "casuals like myself" would be able to catcch up on the line AND THEN subscribe to get the great new characters coming our way.